There are a number of ways to keep a gorgeous bouquet of flowers alive and looking beautiful longer. The tips I recommend don’t involve buying any products or using any chemicals. 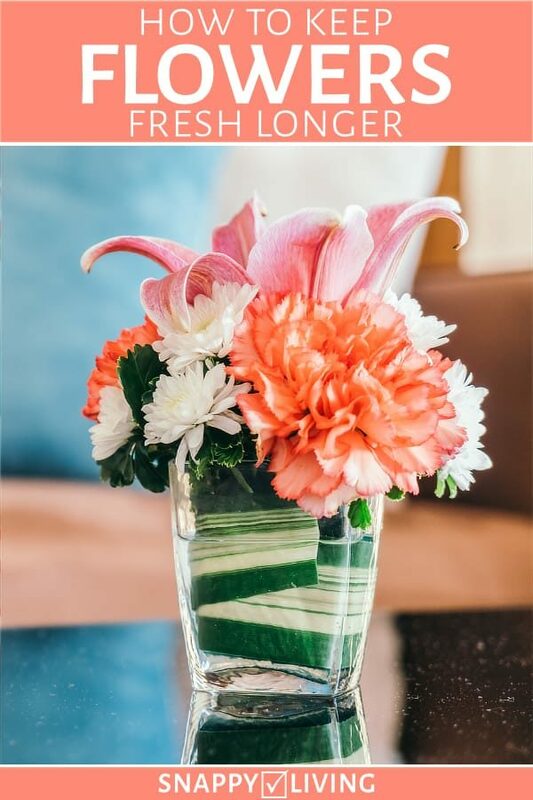 You most likely have everything you need around your home already to keep flowers fresh longer. There are a lot of myths about what will keep fresh-cut flowers looking good for longer, so some of these tips will be about debunking those. Others will be about what you should do to keep them fresh. 1. Give them room. Florists often cram bouquets into very small vases so the flowers are competing for water. The more room they have, the longer they’ll stay fresh looking. Put them in a larger vase, or split the bouquet in two or three parts and put them in multiple vases. 2. The right amount of water. Only fill the bottom of the vase with about three inches of water. More than that will start to decay the stems. Keep refilling it to the three inch mark, though, so they don’t go thirsty. 4. Remove leaves below the waterline. Leaves below the waterline can start to decay and contaminate the water, so make sure what’s underwater is nothing but stems. The one exception: leave rose thorns on, since they are really part of the stem. 5. Trimming the stems. This is important not only for fitting the flowers into another vase, but also for enabling the stems to “drink” plenty of water. Use a sharp knife and hold the stem under running tap water (lukewarm, again). Trim off about an inch from the bottom at a forty-five degree angle (don’t use scissors – they can squish the internal structure of the stem. After trimming, also split the stem about an inch up from the cut to give it even more access to water. 6. Maintenance. Every other day, trim another quarter inch off the bottom of the stems, again with a sharp knife at a forty-five degree angle. Change out the water in the vase (completely). Prune any dead leaves, and dead or tightly closed buds, from your flowers so they’re not consuming nutrients the rest of the plant would benefit from. 7. No direct sunlight. Wildflowers don’t typically grow in areas with lots of direct sunlight. Cut flowers also appreciate a break from direct sunlight, which can dry them out and age them faster. 8. Give them plant food. You can add plant food to the water. You can make your own plant food, too. 9. Don’t give them aspirin. This old folk remedy doesn’t really work, and can shorten the lives of some flowers.